Friday night: Chilly, mostly clear. Lows in the 40s and 50s. Saturday: Partly cloudy. Highs in the 60s and 70s. Sunday: Cloudy, wet at times. Highs in the 60s. 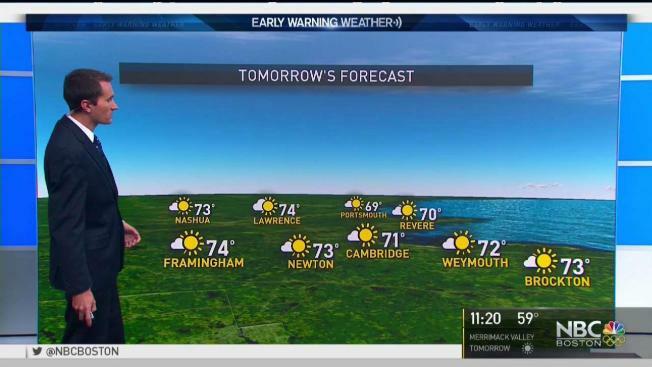 Monday: Mostly sunny, warm. Highs around 80. For our Friday evening and overnight, under mostly clear, starlit skies, overnight lows will slip near 50 around Boston, 40s in the suburbs and even a few 30s into far northern New England, where a frost advisory has been issued for early Saturday morning in northeastern Vermont, northern New Hampshire and interior Maine. Greg Maslawe at Newton Community Farm explains the need to cover your plants ahead of a cold Friday night. After a cool, possibly record-cold, start to our Saturday, temperatures will rebound back to near 70 by the afternoon under mostly sunny skies, so the first half of the extended holiday weekend be pleasant. Saturday night is when clouds start to build in advance of the remnants of Harvey. The big dome of high pressure over New England that brought nice, fall-like weather Friday and Saturday is short-lived as it slides out to sea late Saturday evening, and as clouds slide in ahead of the rain associated with Harvey. The moisture associated with remnants of Harvey work their way in by early Sunday morning, starting south and spreading northeastward, with a few heavy downpours for the Cape and the Islands possible. A few more embedded downpours are possible through midday, spreading from southwest to northeast into parts of New Hampshire. Remnants of Harvey should clear the area by late Sunday evening, giving way to a nice Labor Day Monday. High temperatures this weekend range from upper 60s to low 70s both Saturday and Sunday with more cloud cover Sunday along with those scattered showers. Monday brings highs back to near 80 under partly sunny skies. As everyone heads back to work or school on Tuesday after the long holiday weekend, highs Tuesday will remain in the low 80s with humidity sliding back in, then we see the chance for showers midweek, lowering humidity and the high temperatures back into the lower 70s by Wednesday. We are still watching the tropics, as Hurricane Irma is expected to strengthen to a Cat. 4 as it closes in on the Leeward Islands by Wednesday. We are continuing to track Irma as some weather models hint to Irma sliding up the east coast. As always, stay tuned for the latest updates on your local forecast and on the tropics as we are halfway through the hurricane season.